Joyous Day ... | A.B.E. Remodeling, INC.
Good Evening and Happy Easter. By now I believe most of you have finished your Easter dinners that perhaps you have spent with family or friends and our hope is that you had a very lovely day and remembered the many blessings in your lives on this "Resurrection Day". The Lord is risen!! If you've had food on your table, you've been blessed. If you had time with your family or friends, you've been blessed. If you've seen the faces of little children hunting for colored eggs, you've been blessed. If you've had the chance to wish a stranger a Happy Easter, you've been blessed. If you've had the opportunity to attend a church of your choice, you've been blessed. Now as the weeks continue we trust that your life continues to be filled with many blessings. Before this day has ended, we wanted to send our sincere greeting to you and yours…to wish you all a wonderful and beautiful Easter evening. 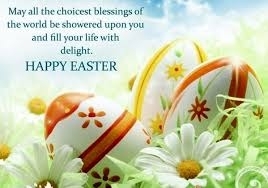 Respectfully we wish you all a HAPPY EASTER.